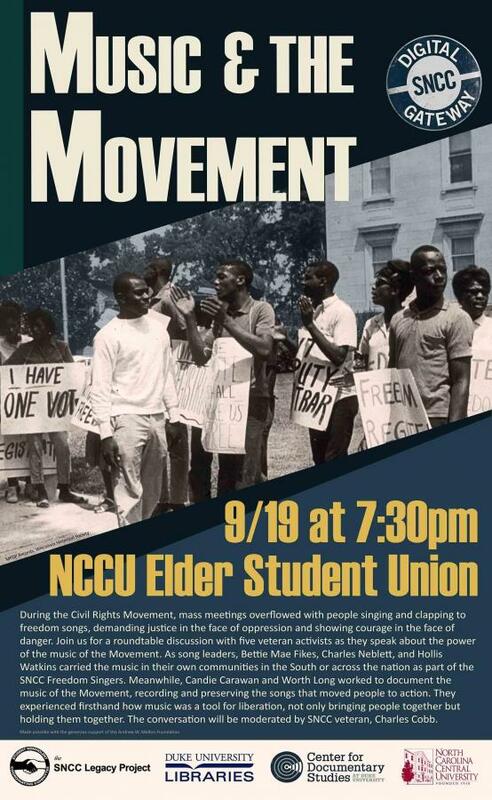 Please join us for an exciting discussion with five veteran activists on Tuesday, September 19th at 7:30 p.m. at NCCU’s Alfonso Elder Student Union. Music & The Movement – During the Civil Rights Movement, mass meetings overflowed with people singing and clapping to freedom songs, demanding justice in the face of oppression and showing courage in the face of danger. Join us for a roundtable discussion with five veteran activists as they speak about the power of the music of the Movement. As song leaders, Bettie Mae Fikes, Charles Neblett, and Hollis Watkins carried the music in their own communities in the South or across the nation as part of the SNCC Freedom Singers. Meanwhile, Candie Carawan and Worth Long worked to document the music of the Movement, recording and preserving the songs that moved people to action. They experienced firsthand how music was a tool for liberation, not only bringing people together but holding them together. The conversation will be moderated by SNCC veteran Charles Cobb. Many thanks to our co-sponsors: SNCC Legacy Project, Duke University Libraries, The Center for Documentary Studies, North Carolina Central University, and SNCC Digital Gateway Project. The popular Netflix series Orange is the New Black, based on the memoir of the same name by Piper Kerman, has brought renewed attention to the conditions inside U.S. women’s prisons. While prison reform has not been contemporarily understood as a priority of the LGBTQ and feminist communities, the special collections at the David M. Rubenstein Rare Book & Manuscript Library, illustrate the degree to which prison reform and anti-prison activism have, since the 19th century, operated as a cornerstone of both LGBTQ and feminist movements. In the 19th century, charity efforts led by white middle-class feminists led to the creation of prison reform organizations such as the Women’s Prison Association (WPA) and the Gilbert Library and Prisoners’ Aid Society. These organizations advocated for separate women’s reformatories, the decriminalization of prostitution, rehabilitation programs for former inmates, and the creation and expansion of prison libraries. These early reform efforts are reflected in the ledger and scrapbook of Linda Gilbert, the founder and president of the Gilbert Library and Prisoners’ Aid Society. 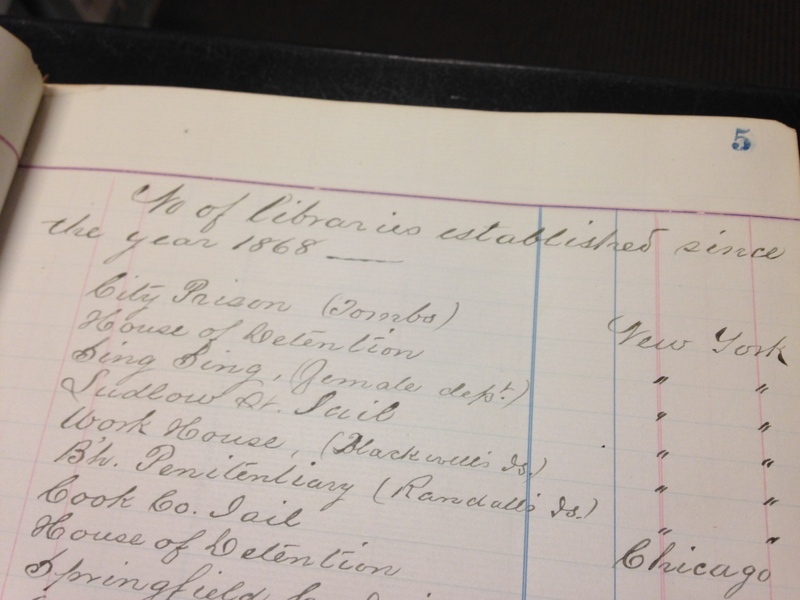 The ledger details Gilbert’s fundraising efforts on behalf of the organization and the expenses it incurred from roughly 1868 to 1894, as it helped to establish libraries in institutions such as the New York House of Detention, Ludlow St. Jail, and Sing Sing Female Prison. A pamphlet included in the Linda Gilbert scrapbook speaks to the particular significance of prison libraries and literature to reformers of this period, who saw increasing literacy among prisoners and increasing access to reading material as central to their moral improvement. 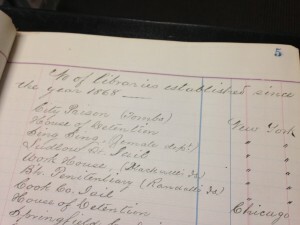 The incarceration collections held in the Rubenstein Library, however, reflect the importance of circulating periodicals to prison reform efforts more generally, and the changing role of reading and writing in prison reform movements over time. In the 1960’s and 70’s, prison libraries and education programs helped to instigate an expanding prisoners’ rights movement both within and beyond prison walls. 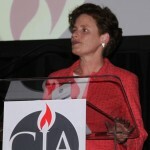 These efforts are reflected in several women’s prison newsletters and pamphlets that were published by lesbian feminist organizations in the late 20th century, including “No More Cages” and “Through the Looking Glass,” which are held in the Atlanta Lesbian Feminist Alliance Periodicals Collection and the Women’s and Lesbian, Gay, Bisexual, and Transgender Movements (LGBTQ) Periodicals Collection, respectively. These newsletters were the collaborative projects of lesbian feminist and anti-prison activists in the late twentieth century in the context of neo-liberal economic policies, intensifying restrictions on access to welfare, and a corresponding rise in incarceration rates. 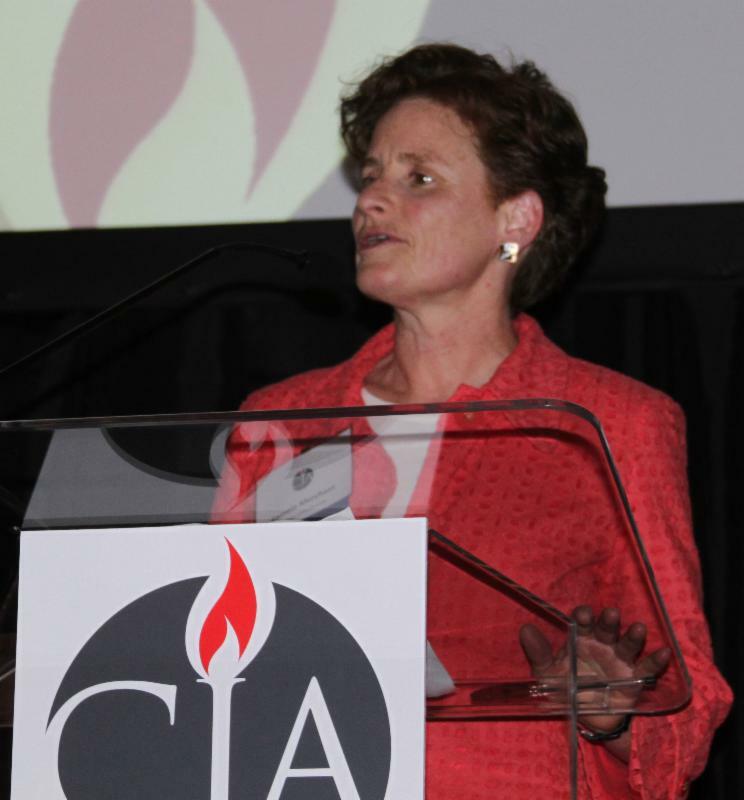 The newsletters that grew out of these coalitions often aimed their critiques at increasing restrictions on access to welfare that, while initiated by the Nixon administration, were part of a larger conservative backlash against the Economic Opportunity Act of 1964 that continued through the 1990’s, making women of color, in particular, vulnerable to mass incarceration. 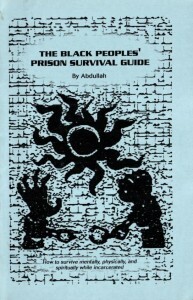 “Break ‘de Chains of U.S. Legalized Slavery,” a joint publication between the Triangle Area Lesbian Feminists’ Prison Book Project and inmates at the North Carolina Correctional institute for women, documents a prison rebellion at the North Carolina Correctional Institute for Women in 1975 that began as a work stoppage in the prison laundry. The pamphlet not only critiques healthcare and labor conditions in the prison, but contests media accounts of the rebellion itself. Additionally, the Rubenstein Library also holds a publication from Action for Forgotten Women, a feminist organization that was also active in the Triangle in the 1970’s. Gay and lesbian publications such as Feminary, Lesbian Tide, RFD, and Gay Community News, which frequently reported on conditions inside prisons and incidents of police brutality, gave advice to gay and lesbian readers about how to protect themselves from law enforcement, and published letters from prisoners that also circulated widely both inside and outside of prisons during this period. These publications helped to galvanize support for prisoners, and encouraged readers to understand the policing and criminalization of gender and sexual non-normativity as intersecting with the policing and criminalization of people of color, immigrants, and the poor. More recently, zines distributed by prison books programs, anti-prison zine distros, and collectively owned bookstores and activist centers have done similar work, attempting to fill a gap left by increasingly restrictive policies and funding for prison libraries and education. 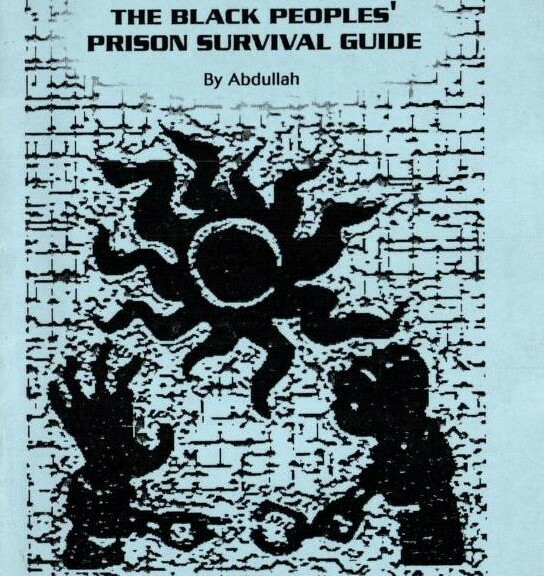 Many of the most widely circulating zines are included in the Incarceration Zine Collection, part of the Human Rights Archive, which was acquired from the Chicago Anarchist Black Cross Zine Distro. 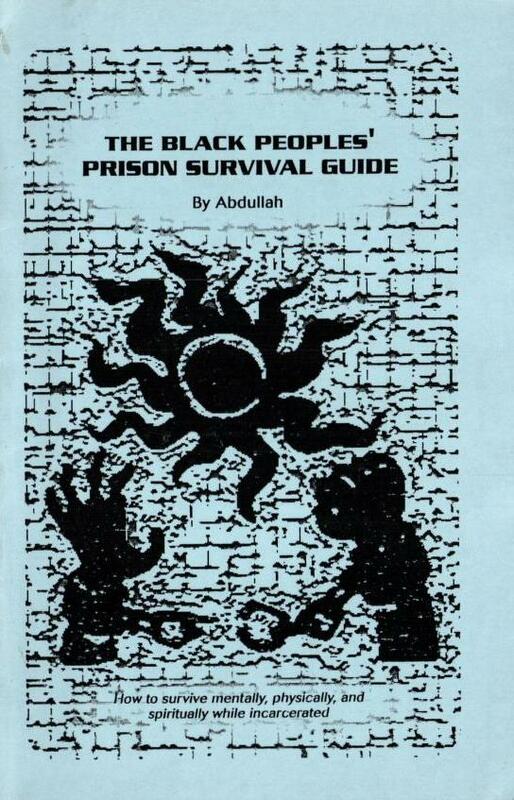 The collection spans the years from 1995 to 2007, and includes 103 zines distributed inside and outside of jails and prisons, with writing by notable inmates and anti-prison activists, including Mumia Abu-Jamal, Sundiata Acoli, Ashanti Alston Omowali, David Gilbert and his son, Chesa Boudin, Kevin “Rashid” Johnson, Dennis Kyne, Anthony Rayson, Bobby Sands, Sean Swain, and Harold H. Thompson. Zines related specifically to the concerns of women and LGBTQ people, including The Invisibility of Women Prisoners’ Resistance, Reaching through the Bars, Tenacious: Art and Writings from Women in Prison, and Queers Bash Back can be found in the Bingham Center Women’s Zine Collection. These resources offer researchers insight into the dialogue amongst prison reformers and anti-prison activists both inside and outside of prison, and into the particular role of reading and writing in the expansion of prison reform and prisoners’ rights movements. The David M. Rubenstein Rare Book & Manuscript Library at Duke University has received a grant of $200,000 from the National Endowment for the Humanities to support Voices of Change: Preserving and Presenting Radio Haiti. This two-year project, set to begin in July 2015, will preserve and make widely available the written- and spoken-word archives of Radio Haiti Inter, the country’s oracle of democracy from the late 1960s until its closure in 2003. 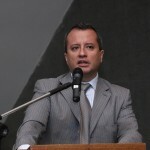 The announcement of the award coincides with the fifteen year anniversary of the assassination of the station’s owner and Haiti’s most prominent journalist, Jean Dominique, and amidst continuing news coverage about the ongoing trial of his accused murderers. The Human Rights Archive at the Rubenstein Library received the archives of Radio Haiti in late 2013 as a gift from Michèle Montas, the station’s co-anchor and widow of Dominique. 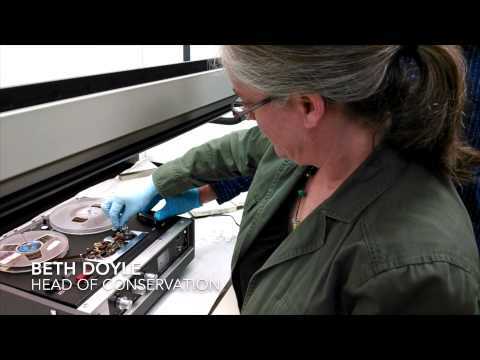 “To me, Duke University was the most welcoming environment for these unique archives, with knowledgeable teams of scholars and archivists able to preserve the past and help to use that recent past as a tool to re- imagine the future,” commented Montas about her decision to place the archives at Duke. 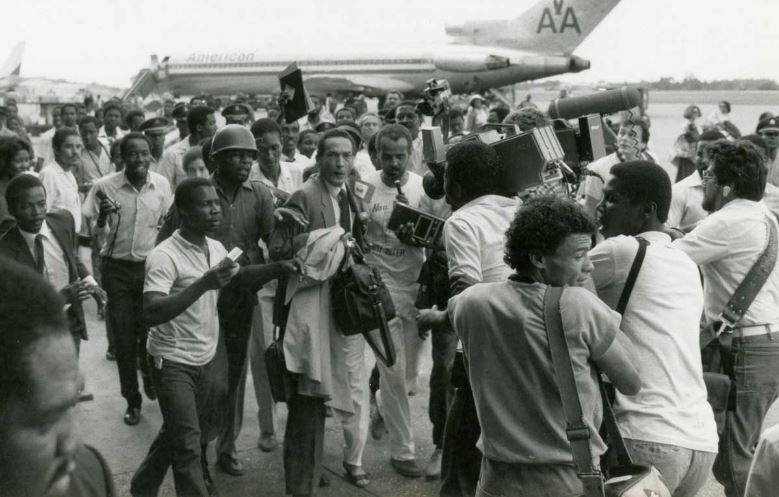 As evidenced in the more than 3,000 recordings and 70 linear feet of paper records comprising the collection, Radio Haiti distinguished itself from other media outlets in Haiti by covering not only events in Port-au-Prince but news from the rural areas of Haiti, including a grassroots democratic movement that eventually overthrew the Duvalier dictatorship in 1986. It was the first independent radio station in Haiti, and the first to broadcast in the language of the people, Haitian Creole, instead of the French spoken only by Haiti’s elite. The collection is one of the most important and comprehensive resources available for studying and understanding the recent history of Haiti. 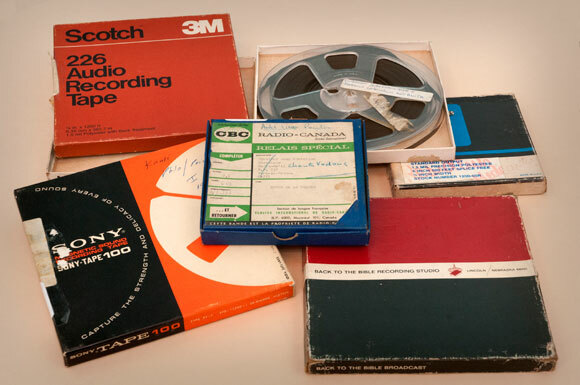 Primary materials related to Haiti are relatively rare, and the archives of Radio Haiti are particularly distinct both for the depth and breadth of their coverage. 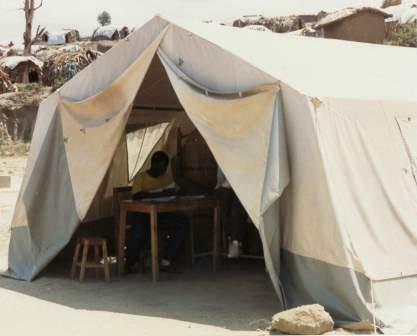 According to Laurent Dubois, project advisor and Marcello Lotti Professor of Romance Studies and History at Duke, “The Radio Haiti Archives represent a tremendous resource for scholars, educators, and the general public interested in culture and politics in Haiti from the late 1970s to the present. 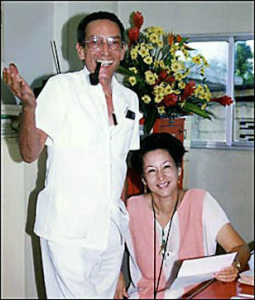 Under the leadership of Jean Dominique and Michèle Montas, the station served as a critical voice for reportage, debate, editorials, and news for several decades.” Access to these important primary materials will allow scholars to write the history of the country in nuanced and participatory ways. As part of preparing the grant proposal, Library staff completed a pilot project cleaning and digitizing a selection of tapes from the Radio Haiti Archives. Grant funding will support a full-time project archivist fluent in both Haitian Creole and French to oversee the arrangement, description, digitization and preservation of these materials. To support multilingual and international research, audio recordings will be described in French, Haitian Creole, and English, and will be made freely available online via Duke’s Digital Collections, the Digital Public Library of America, and the Digital Library of the Caribbean. In order to promote easy access to these materials in Haiti, the Library will partner with the Forum for Scholars and Publics at Duke and FOKAL (La Fondation Connaissance et Liberté/Fondasyon Konesans Ak Libète), a community organization in Haiti, to place digital copies of the recordings in libraries throughout Haiti. The team will also explore creating podcasts from the recordings to allow for easier access in regions with intermittent internet connectivity. The Radio Haiti collection is a singular resource supporting a nuanced and comprehensive understanding of the last 50 years’ of Haiti’s history. By preserving and making accessible these archives, Duke University Libraries seeks to advance the dialogue not only about Haiti’s past but also about its future. Those interested in learning more about the archives of Radio Haiti are encouraged to visit the pilot site developed collaboratively between the Forum for Scholars and Publics and the Library at http://radiohaitilives.com/. This site includes access in Creole and English to all the recordings reformatted as part of the planning phase of the grant. Post contributed by Kat Stefko, Head of Technical Services. The Voices of Change project was made possible through a generous grant from the National Endowment of the Humanities. Contact: Patrick Stawski, patrick.stawski@duke.edu 919-660-5823. 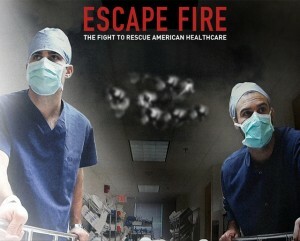 Rights!Camera!Action presents Escape Fire: The Fight to Rescue American Healthcare , 2012 winner of the Full Frame Film Festival Human Rights Award. Directed and produced by Matthew Heineman and Susan Froemke, Escape Fire tackles one of the most pressing issues of our time: how can we save our badly broken healthcare system? It’s not surprising that healthcare tops many Americans’ concerns and is at the center of a political firestorm in our nation’s Capitol. But the current battle over cost and access does not ultimately address the root of the problem: we have a disease-care system, not a healthcare system. 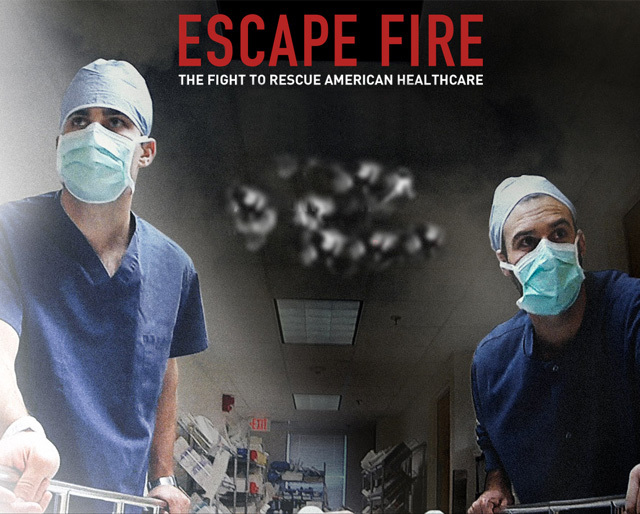 Escape Fire examines the powerful forces maintaining the status quo, a medical industry designed for quick fixes rather than prevention, for profit-driven care rather than patient-driven care. After decades of resistance, a movement to bring innovative high-touch, low-cost methods of prevention and healing into our high-tech, costly system is finally gaining ground. A panel discussion will follow the screening. Sponsored by the Human Rights Archive at the Rubenstein Library, and the Duke Human Rights Center @ FHI. Marcos Hernandez lives and works in Chicago. He came to the United States from Mexico, after a life-threatening border crossing through the Sonora Desert in southern Arizona. Each month, he sends money to his mother in Mexico City to buy medicine for his brother, Gustavo, who needs a kidney transplant. 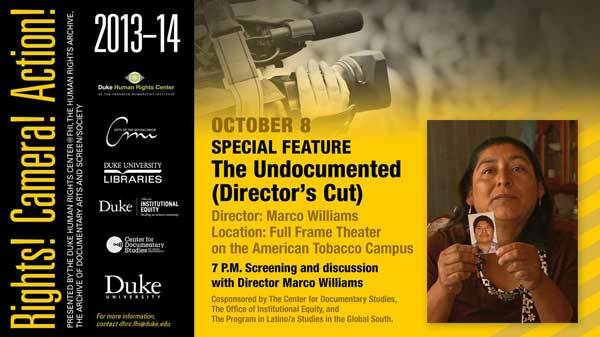 The Undocumented, by acclaimed filmmaker Marco Williams, is Marcos’s story—as well as the story of countless other migrants. Chronicling Arizona’s deadliest summer months, award-winning documentary and fiction film director Marco Williams (Banished, Two Towns of Jasper, In Search of Our Fathers) weaves Marcos’s search with the efforts of humanitarians and Border Patrol agents who are fighting to prevent migrant deaths, the medical investigators and Mexican Consulate workers who are trying to identify dead border crossers, and Mexican families who are struggling to accept the loss of a loved one. 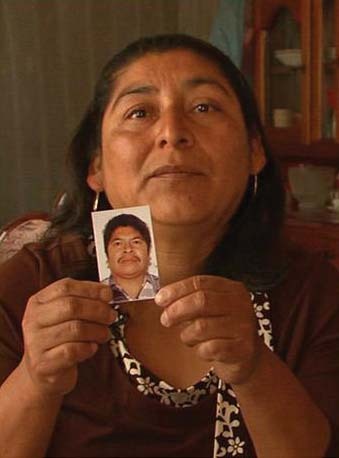 In true cinéma vérité style, The Undocumented (91:00 TRT; 2013 Full Frame Honorable Mention for Kathleen Bryan Edwards Award for Human Rights) reveals the ongoing impact of immigration laws and economic policies on the very people who continue to be affected by them. By going beyond politics, the film also tells a story that is deeply personal. The screening, which is free and open to the public, will be followed by a panel discussion featuring director Marco Williams and Duke University professor Charlie Thompson. Rights!Camera!Action! is sponsored by the Archive of Documentary Arts and the Human Rights Archive in the Rubenstein Library, the Duke Human Rights Center @ FHI, and the Program in the Arts of the Moving Image. In June and July we’ll celebrate the beginning of a new fiscal year by highlighting new acquisitions from the past year. All of these amazing resources will be available for today’s scholars, and for future generations of researchers in the Rubenstein Library! Today’s post features a key early work in the development of the concept of human rights. 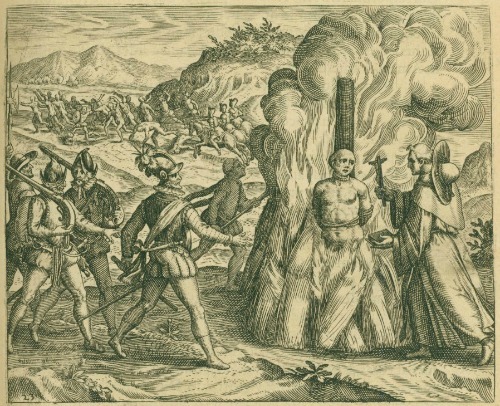 Bartolomé de las Casas, a Dominican friar and one of the first Spanish colonists in the Caribbean, is best known today for his exposé of the horrifying treatment of indigenous peoples by Spanish settlers during the first decades of colonization. First published in a 1550s series of tracts in Seville, the tracts represented the first argument for the rights of American Indians to be treated as fellow human beings, the first argument for the abolition of slavery in the New World, and one of the first attempts to appeal to a universal code of human rights. 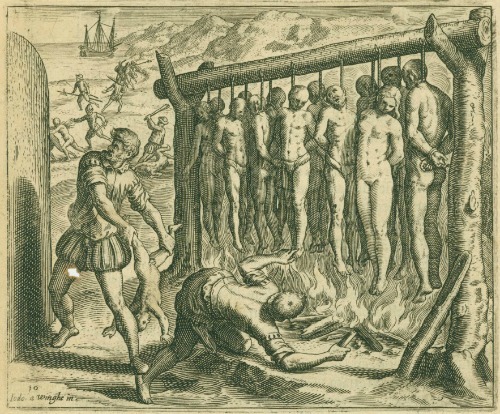 The tracts, especially the sensational details of torture, abuse, and murder, spread throughout Europe as evidence of the Spanish abuse of power in the New World. The Library’s new acquisition is the first Latin translation and first illustrated edition of Las Casas’ text, entitled Narratio Regionum Indicarum per Hispanos Quosdam Devastarum Verissimi…, published in Frankfurt in 1598. The work features a powerful series of eighteen copper engravings by Theodor de Bry, depicting abuses of the native peoples. Image courtesy Dorothy Sloan Books. De Bry never visited the New World, and the images can be seen as prime examples of the “Black Legend” of sensationalistic, anti-Spanish (and anti-Catholic) propaganda used to curb the might of the Spanish empire. This edition of the work of Las Casas advocating for basic human rights for the native populations of the Americas was wildly popular and influential, thanks in part to the images, which retain some of their original power to shock and provoke thought about the treatment of the original inhabitants of the New World. Post contributed by Will Hansen, Assistant Curator of Collections. During colonization from the late 19th to the mid-20th century, the German and Belgian colonial elite manufactured a native elite in the Tutsis, a process of colonization that Franz Fanon describes in The Wretched of the Earth. Hutus thus experienced discrimination in education and various sectors of the economy. In 1959, Hutus took control of Rwanda following the independence movement, forcing many Tutsis to seek refuge in neighboring countries. In 1990, the Rwandan Patriotic Front (RPF) comprised of exiled Tutsis, invaded Rwanda, initiating a civil war. 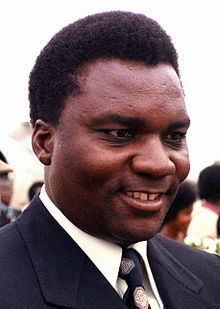 Habyarimana’s assassination resulted in an escalation of Hutu anxiety that the Tutsis would seize power of the government and that discrimination against Hutus would be reestablished. Radio became a powerful weapon used to incite and direct the Rwandan genocide. The majority of radio broadcasts in the Rwandan audiotapes collection are from the privately-owned Radio Télévision Libre des Milles Collines (RTLM). What I found especially interesting about the content of these broadcasts (the transcripts of which can be found in the IMI organizational records and the audiotapes of which can be found in the Rwandan Videotapes and Audiotapes inventory) was the way in which its efforts to direct the extermination of the Tutsi population was paralleled by its efforts to claim authority over the telling of history. The radio broadcasts reveal a struggle over who gets to tell history and, therefore, a struggle over a monopoly on truth. In other words, the RTLM broadcasts exhibit a phenomenon which seems to be more universally true, which is the political necessity of storytelling. There are a few particularly conspicuous aspects of the history-telling of the RTLM broadcasts, one being the discourse of revelation or enlightenment – the idea that if we only peel back the layers, we can finally see the truth. And this encounter with the truth is the basis for political action, or, in this case, the basis on which genocide becomes justified. “Slavery,” for example, is a term that is repeated throughout these broadcasts. Several journalists recall the state of Hutu slavery during colonization in order to characterize the discrimination Hutus experienced. Drawing on such a vocabulary, the radio broadcasts attempt to illuminate the Rwandan genocide as a slave rebellion. Freedom from slavery, according to this narrative, lies in the ability to discover the true history and nature of that discrimination, in opposition to the stories of the colonizers and the native elite. For the same reason, I’m less interested in the truth or accuracy of this, or any, construction of history than in the need and tendency to construct history more generally. Listen to an excerpt of this broadcast here. In a second broadcast from April 17, 1994 (11 days after the assassination), journalist Agenesta Mukarutama leads a roundtable discussion about how the RPF seeks to return Rwanda to its pre-revolutionary time in which the Tutsi commanded and the Hutu obeyed. “But,” the broadcast tells us, “Rwandans have learned their history and are ‘saying no’ to a repetition of history.” Genocide is perceived as the only way to break out of an historical cycle of discrimination and oppression. 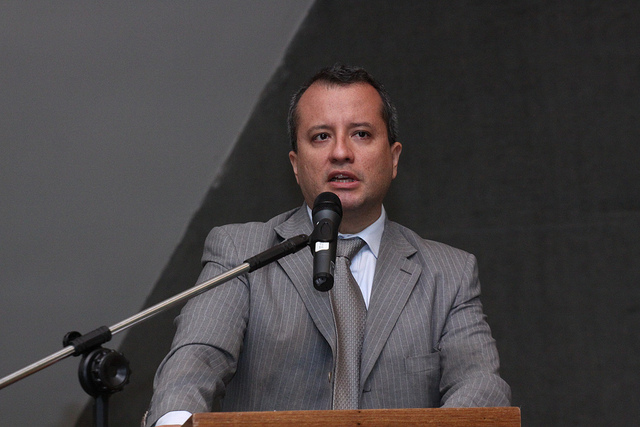 Murego argues that “what it [the RPF] did not understand is a lesson from history. In fact, the political skeleton before ‘59 is clear: Some people command and others obeyed, and the RPF inserted its objectives in that scope . . . Since the conditions have changed, there is now no way to impose oneself as it was before . . . what happened is that it is a genuine restoration of the former reality where some people commanded, you understand who, and others have learnt to say ‘no.’ That is where the president of the PL [le Parti libéral] has made an important statement: ‘those who are saying no today, they are saying no considering their history, the history of their country . . .’” (emphasis is mine). Ngirumpatse refers to the Arusha Accords as exceptional insofar as they are exceptionally generous; this generosity, it seems, arises from the mistaken belief among Rwandans that their revolution was finished once and for all. But again, what is more interesting to me is the temporality of the historical discourse within the broadcasts themselves – the repetition of the insistence that history cannot and will not repeat itself. Post contributed by Clare Callahan, graduate student assistant in Rubenstein Technical Services and the Human Rights Archive. 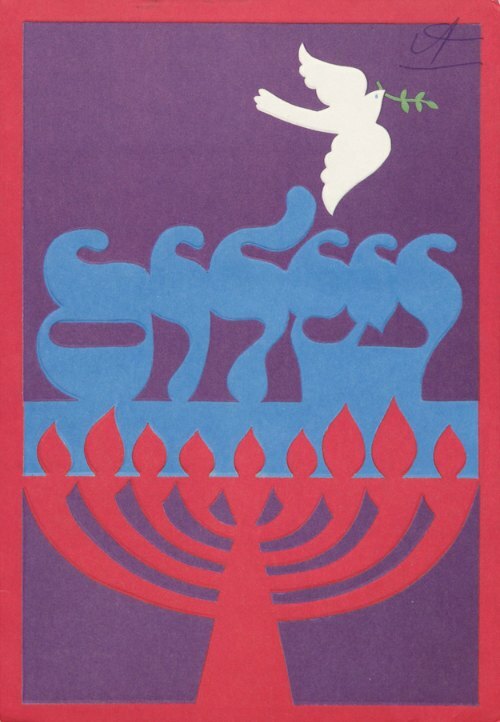 Hanukkah card sent to Marshall Meyer by Débora Benchoam, November 1981. From the Marshall T. Meyer Papers. The Hanukkah celebrations of 1981 were especially meaningful for Débora Benchoam and Rabbi Marshall T. Meyer. Benchoam had just been released from four years of brutal imprisonment during Argentina’s “Dirty War,” thanks in large part to the efforts of Meyer. She sent this card to Meyer on 26 November 1981. The card and the letter it contains have been digitized and are available for viewing in Duke’s Digital Collections. This card is held in the Human Rights Archive‘s Marshall T. Meyer Papers, documenting Meyer’s tireless human rights activism. To learn more about the story of Benchoam and Meyer, see the online exhibit “I Have No Right to Be Silent: The Human Rights Legacy of Marshall T. Meyer” and this 2009 interview with Benchoam.